We stayed at Copper Mountain for a week. Seen lots of sights. Pikes Peak. Garden of the Gods. Road the train in Leadville. Shopped a lot. I brought a few ultralight fishing pole just in case we wanted to fish. Since I am from Missouri and we fish a lot here …just not for trout. The wife and our boys begged me to fish. As we were shopping in Breckenridge I stumbled across your shop. I went in asked about one day permits. We got the permits and I asked where was a good spot to fish. You told us the ponds along I-70 between Frisco and Copper. I asked what they would be hitting on this time of year and you gave us the inside scoop. You showed me the flies and clear bobbers that I’d need to cast those little buggers. I was very skeptical that we wouldn’t catch a thing. Guess what, we caught countless little brook trout and 3 rainbows. This was on the 10th, we planned to leave for Missouri the morning of the 11th. We went to Frisco that next morning and bought another day tag. Fished until 3:30 pm then headed home. And drove all night to get here. Long story short. If I had found you guys sooner we would of had a lot more fun and spent A LOT less money and done more of what I love. FISHED. Thanks for the info and for being helpful and nice. You made our trip even more fun and memories for our kids they will remember the rest of their lives. Next time I come out I’ll be seeing you again. This email is long overdue but I still wanted to send it. I have been meaning to write and tell you what an outstanding day Troy Booker and I had fishing The Willows private water in August. I bet we hooked 80 fish and probably landed 60. Troy is an outstanding guide who I recommend to my friends that go to Breckenridge. I also constantly recommend your shop as you have one of the finest and smoothest operations for guys like myself who love to fly fish but only get to do it a few times each year. My annual trip with Troy is something I look forward to all year and I am already starting to think about what waters I may reserve. You have a real gem of a guy in Troy. Not only does he share my love of catching fish on the dry fly, but he is also a very knowledgeable guy that can converse on a wide variety of topics. He’s the perfect guide for me as he has the right mix of humor and intensity when stalking the elusive trout. Fishing with him is basically like fishing with a good buddy who just knows a hell of a lot more than you do about fishing. I hope you guys have a nice and trout-filled holiday season. I just wanted to follow up with a quite note regarding a recent half day trip that me and a friend had with one of your guides, Matt Miller. This was the first time either of us had used a guide, and we are both very beginner anglers. We couldn’t have asked for a better experience than what Matt provided. He taught us a lot and was very patient with us. We will definitely use Mountain Angler next time we are in Breckendridge and will certainly be requesting Matt. I just wanted to let you know that my son and i had a great half day trip with Troy on Thursday July 24th. Neither one of us had ever been fly fishing before but Troy was knowledgeable and patient with us and made sure we had a good time. We had a great experience and even caught four trout. Everything about your service was good from the reservation, to the ease of getting fishing license and flies and the quality of your boots and waders. Thanks again for a great trip and if we ever get back to Breckenridge we will be contacting you to set up our next trip. We (Steve and Peggy) just finished a drift trip on the Colorado with Mark Boyd. We both want to let you know how pleasurable it was and what a professional, personable guide and, generally all around good human Mark is. We completely enjoyed the day. Mark knows what he is doing, is quick to share his knowledge and provide guidance, never make anyone feel uncomfortable no matter how badly we screwed up (and believe me, we had some good screw-ups). He made the day a great experience. You already know how good he is; we just wanted to put it down for you to see. Rest assured we will be back and Mark will be guiding us again and again. Not only did you show us a great day on the river; you provided a father and son an activity to bond over for the rest of our lives. We will always be grateful — and we will definitely seek you out when we return to Colorado. Jackson — Just wanted to tell you how much Randy and I enjoyed our 4-day fly fishing adventure! Billy Berger was FABULOUS and such a great teacher and ever so patient! Our trip was ten years in the making and it was everything we thought it would be and then some! As you know, I anticipated only fishing a day or two, but Billy made it so much fun and the settings were so gorgeous, four days weren’t enough! Thanks for all your help in arranging our trip and all the helpful hints about Breckenridge. See you next year! 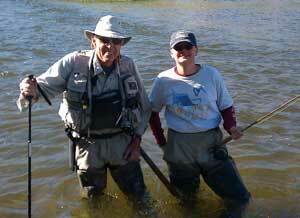 I wanted to thank you for a great day on Holmestead ranch on South Platte River. We hooked over one hundred fish for the epic day. For someone that has used literally hundreds of guides Scott was great all around and had the patience of Job. I look forward to coming back to see some new water. Dear mountain angler thank you for a great time fly fishing with Dave Collins as my guide. he was very good at teaching me how to fly fish and read the water to find the many fish we caught. again it was great fishing with dave, so thank you mountain angler for having dave as my guide, it was a great time. Dear Ken and Others at Mountain Angler, this is the second year I have been guided by your guide, Craig Kriers. Both times we were on private waters. This time I gave to Craig the challenge of working with my two grown sons who have not had much fly fishing experience. Craig did great. His soft hand and convincing spirit resulted in both boys catching nice trout. In addition, he taught them how to fly fish in a thorough and interesting way. This message is designed to tell you what you already know – that Craig is a great guide and person. I will be sure to ask for Craig the next time I am out your way. Just wanted to say “Thank you” to Robert, Jeff and Mountain Angler. Robert is a great instructor on providing the basics and techniques of Fly Fishing. I had a great time fishing the areas that Jeff took me to. He is an extremely patient, experienced, and supportive guide. I will definitely be contacting Mountain Angler and Jeff on my next trip to Colorado. Again, “Thank you” for your services and a great experience!!! 4ward to another amazing day on the river with Billy. We have all found ourselves instantly addicted! Good evening, I just wanted to share some positive feedback on my experience with Mountain Angler this past weekend. I was on a 1/2 day fly fishing trip with two buddies and it was all of our first time ever fly fishing. We were lucky enough to get Creig as our guide and we could not of been any happier. Creig was an incredible guide and had us catching fish in no time. He explained every detail about the sport and we have all found ourselves instantly addicted to fly fishing now. Thank you for making our visit to Breckenridge great! We will definitely be back. On a second note, Austin in the shop was also extremely helpful when I was booking my trip. I Would like to let you know that the float trip we took on 16 oct with Jeff was a great time, he displayed great professional skills, had us in fishy waters the whole time, learned me some new fishing skills and displayed a vast knowledge of the sport. I enjoy the people u have working the shop and plan to make Mountain Anglers my one stop fly shop! Have a great day and keep up the great work. Thank you. Thanks Jackson, I had a great fishing experience on the Speer ranch with guide Creig Krier. I will be back next summer and will ask for Creig. I want to take the time to thank you for stopping and helping my Brother-in-Law, Roger and myself while we were wading the South Platte River (Just happened to be your 56th Birthday.) At the time, you were guiding 3 clients (working) along the river. In todays world we don’t see these kind gestures enough. While I was in Breckenridge for 5 days, I was drawn to your store 3 to 4 times spending $$$ each time. A great store with lots to look at and the other Matt and the Boss were very helpful. You guys all seem to work together as a team. Whether your guiding or marketing, keep up the good work. When visiting Breck again, I will use your services. Thanks, again and continue your professional attitude. Mike Juenger from Houston, Tx. I wanted to let you all know what a fantastic time we had today with our guide, Matt Krane. My sister and I took our dad, who suffers from alzheimers, for his 70th birthday on a half day trip. The three of us did not have the best technique or catch the most fish, but we had a great time trying. Matt exceeded our expectations and was a true pleasure to spend the day with! When planning for our families first ever trip to Colorado, I found “The Mountain Anglers” website and called the shop to inquire about a fly fishing trip for my 12 year old son and I. Jackson answered the phone and took the time to answer all of my questions. He made me feel like I was his most important customer, even though he didn’t know me at all. On the day of our trip we arrived at the shop and met our guide Bruce, who could not have been more friendly and engaging. I was also very surprised that the equipment provided (waders, boots, rods, reels and flies) was top quality premium brand merchandise. It was my first fly fishing trip since I was a teenager and my son’s first fly fishing experience ever. On the water, Bruce patiently gave me a refresher course and then spent the rest of the day teaching my son how to cast, set the hook and read the water. It was a wonderful experience for both of us, highlighted by the two dozen trout we caught! I would highly recommend a guided fly fishing trip with The Mountain Angler to anyone. They are friendly, knowledgeable and professional. Our guided fly fishing trip was the highlight of our vacation! Just got in (ft. worth) from breck today… Went out with Scott Gongaware last Tuesday… never held a fly rod before… What a trip!!! Scott is a very patient coach and help me land my first ever trout… It’s true about what he says, “it’s better to have fished and failed than fail to fish”, the scenery is still etched in my mind, the trout was a bonus. Had to stop by my father-in-law’s on the way home… He had an old fly rod he wasn’t using, let me have it… I practiced today… 11 o’clock to 12 ‘clock (i’m a little wristy, Scott will know)…for sure i’m hooked (i know, bad pun)…before we left we booked the cabin we stayed in for next year. we’ll see ya then…and thx Scotty, for an adventure I’ll never forget. I just wanted to let you know that I thoroughly enjoyed my day yesterday on Spinney Mountain Reservoir with Kevin Williams. The fishing was great. Kevin was fun to fish with. I had planned for a river float but really enjoyed the lake float. I definitely plan to do that trip again. The fish were fat and strong and fun to catch.